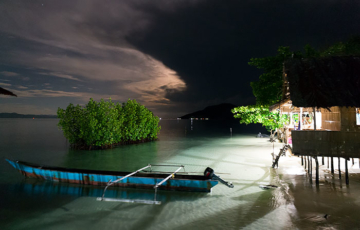 Spacious over-water private bungalows with fans, fabulous views and a rich house reef. Close to the Mantas, and a short walk from Mansuar’s hidden lake. 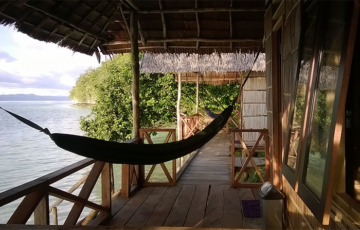 Private over-water bungalows in a quiet cove with great snorkelling, village access, jungle trails and very reasonably priced transfers & boat tours. Great snorkelling on the house reef and at nearby Yenbuba jetty, Walking Sharks in the mangroves, long hiking paths and a restful beachside location. 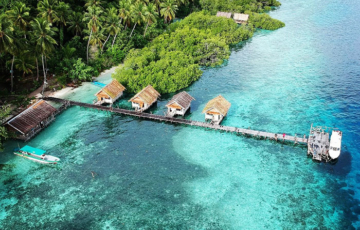 Over-water bungalows next to the path between villages offer a quiet refuge in a sheltered bay central to all the marine attractions of Kri and Mansuar.